The Colours of India collection is woven on the mercerized cotton warp with 23 colours in it. The first wrap in the Colours of India collection. 10/2 mercerized cotton warp. 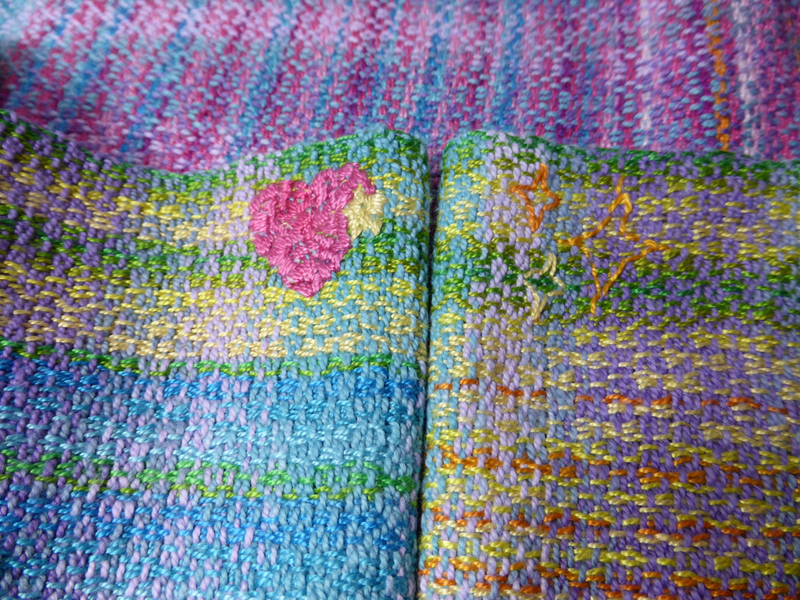 Primary weft: thick rose ramie, accent weft: thick yellow ramie. Glitter in the warp. Woven middle marker. Crackle weave pattern. 410 GSM. 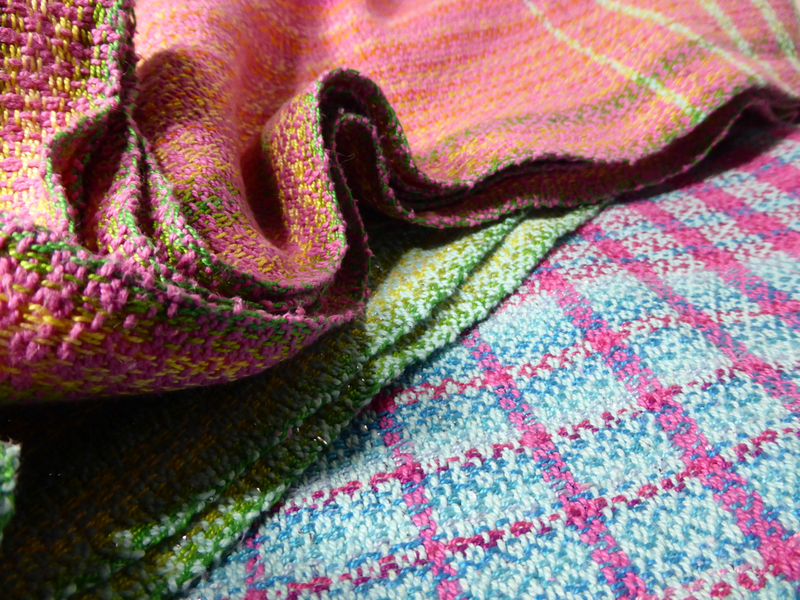 The Colours of India collection, wrap #2, with 10/2 mercerized cotton warp. Primary and accent wefts: 8/2 variegated cotton. Woven middle marker. Crackle weave pattern. 360 GSM. The Colours of India collection, wrap #3, with 10/2 mercerized cotton warp. Primary and accent wefts: 8/2 tencel. Hand-embroidered middle marker. Crackle weave pattern. 380 GSM. The Colours of India collection, wrap #4, with 10/2 mercerized cotton warp. Primary weft: 8/2 cottolin. 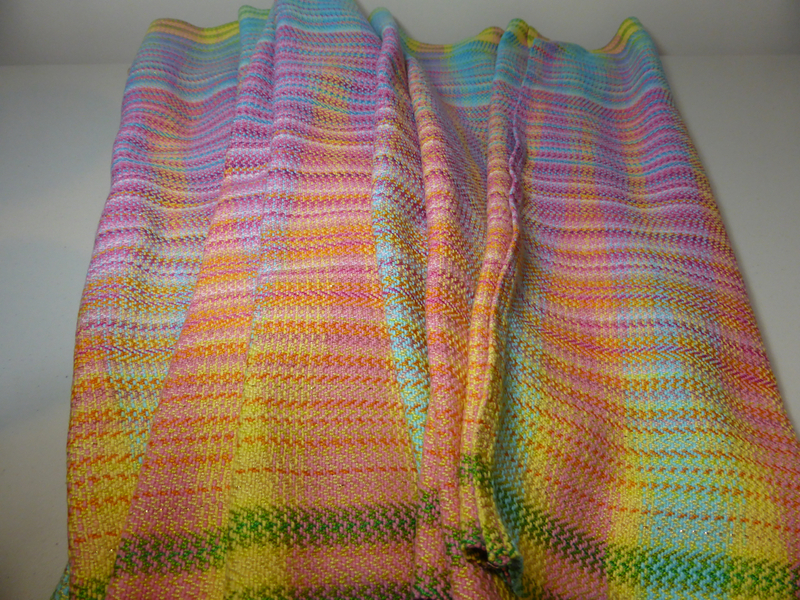 Accent weft: 8/2 variegated cotton. Hand-embroidered middle marker. Crackle weave pattern. 340 GSM. 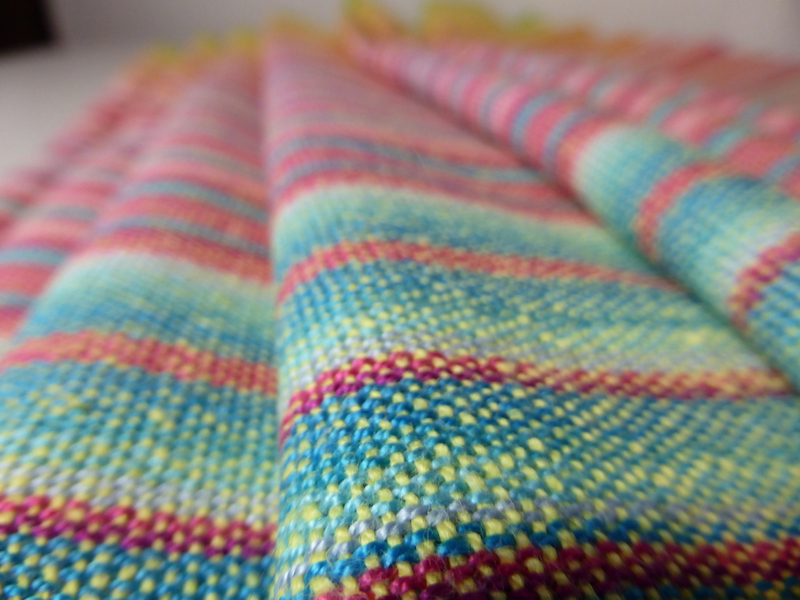 The Colours of India collection, wrap #5, with 10/2 mercerized cotton warp. Primary and accent wefts: 10/2 mercerized cotton. Hand-embroidered middle marker. Crackle weave pattern. Glitter in warp and tail weft. 350 GSM. 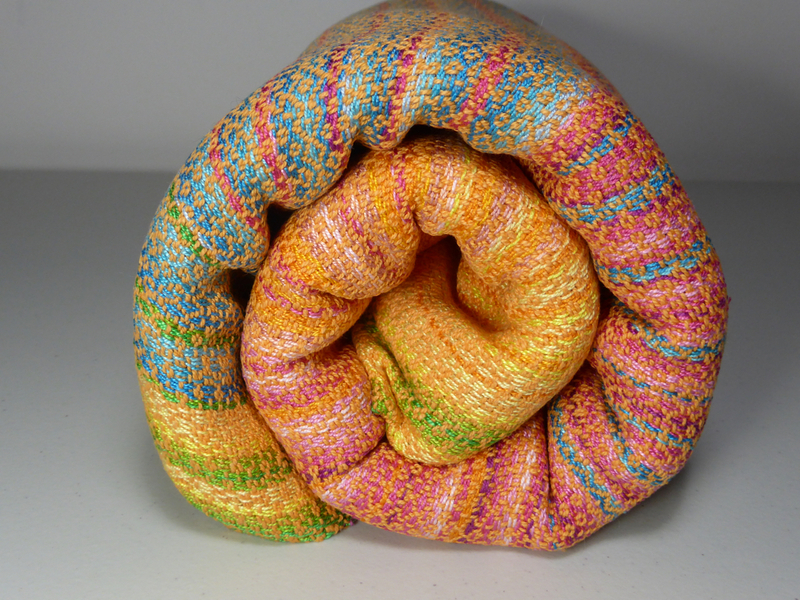 The Colours of India collection, fabric for a ring sling, #6, with 10/2 mercerized cotton warp. 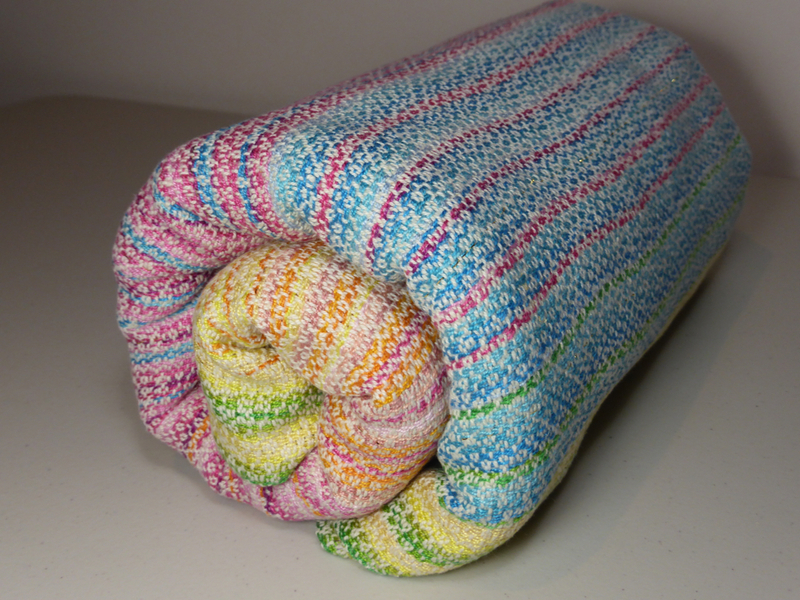 Weft: medium thick ramie. Hand-embroidered middle marker. Crackle weave pattern. Lots of glitter in the warp. 360 GSM. 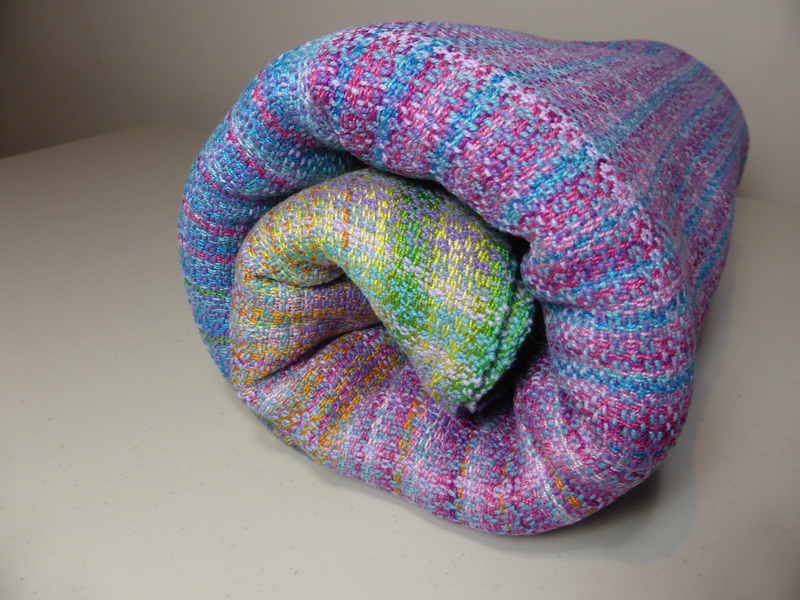 The Colours of India collection, wrap #7, with 10/2 mercerized cotton warp. Weft: 8/2 variegated cotton. Hand-embroidered middle marker. Crackle weave pattern. Glitter in the tail weft accent. 350 GSM. 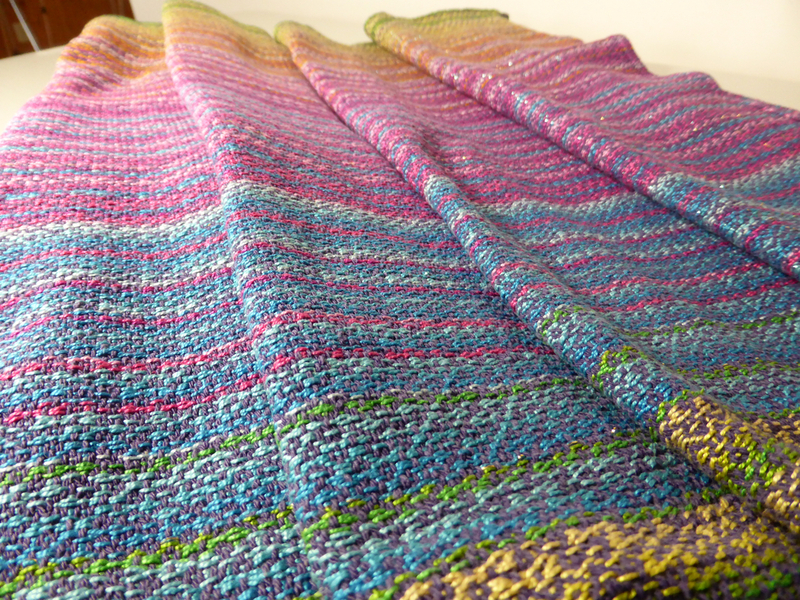 The Colours of India collection, wrap #8, with 10/2 mercerized cotton warp. Weft: 8/2 variegated cotton. Hand-embroidered middle markers. Crackle weave pattern. Glitter in the tail weft accent. 340 GSM. 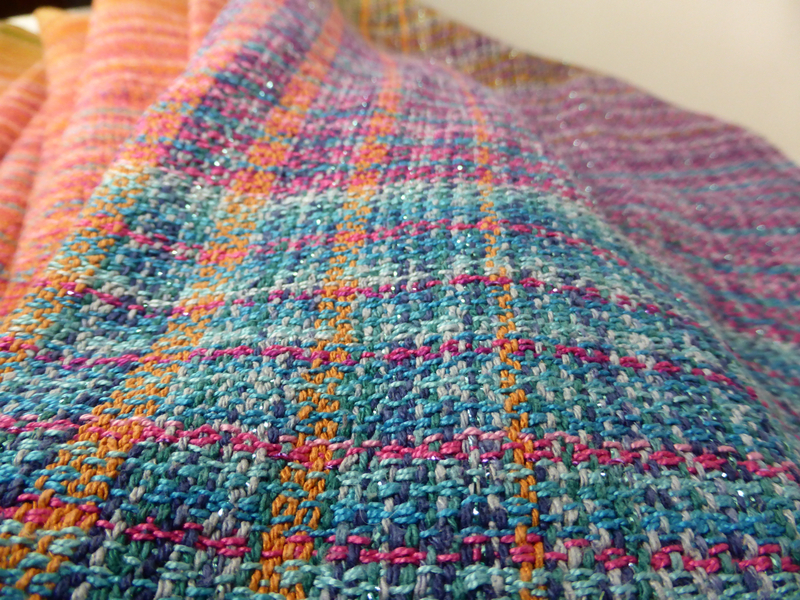 The Colours of India collection, wrap #9, with 10/2 mercerized cotton warp. Weft: 8/2 variegated cotton. Hand-embroidered middle markers. Twill weave pattern. Glitter in the tail weft accent. 340 GSM. The Colours of India collection, fabric for the ring sling, #10, with 10/2 mercerized cotton warp. Weft: 8/2 cottolin. Plain weave pattern. 230 GSM. The Colours of India collection, wrap #11, with 10/2 mercerized cotton warp. Weft: 8/2 cotton/hemp blend, hand-dyed. Crackle weave pattern. Hand-embroidered middle marker. 340 GSM. The Colours of India collection, wrap #12, with 10/2 mercerized cotton warp. Weft: 8/2 cotton/hemp blend. Crackle weave pattern. 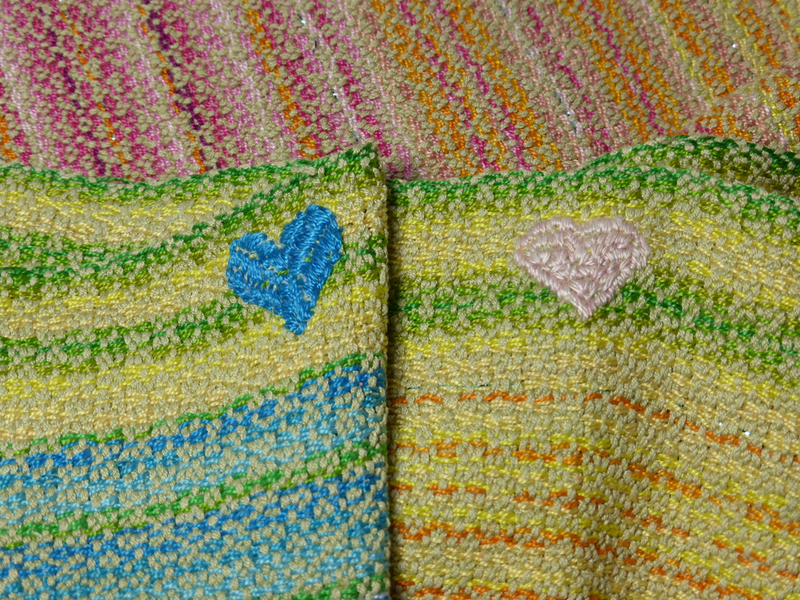 Glitter in the warp and weft accent tails. Hand-embroidered middle markers. 340 GSM. The Colours of India collection, wrap #13, with 10/2 mercerized cotton warp. Weft: thick Mulberry spun silk in three colours. Crackle weave pattern. 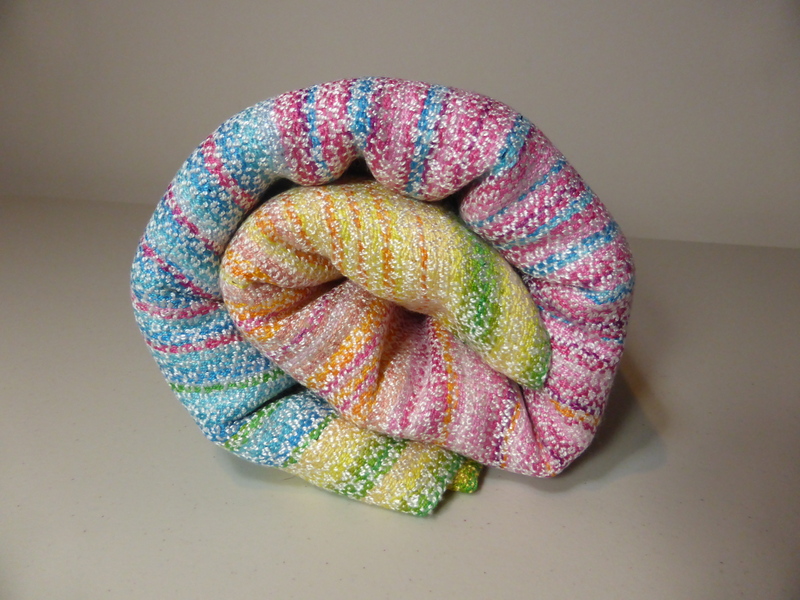 Glitter in the warp and weft accent tails. Hand-embroidered middle markers. 400 GSM. The Colours of India collection, wrap #14, with 10/2 mercerized cotton warp. Weft: thick bourette silk. Crackle weave pattern. 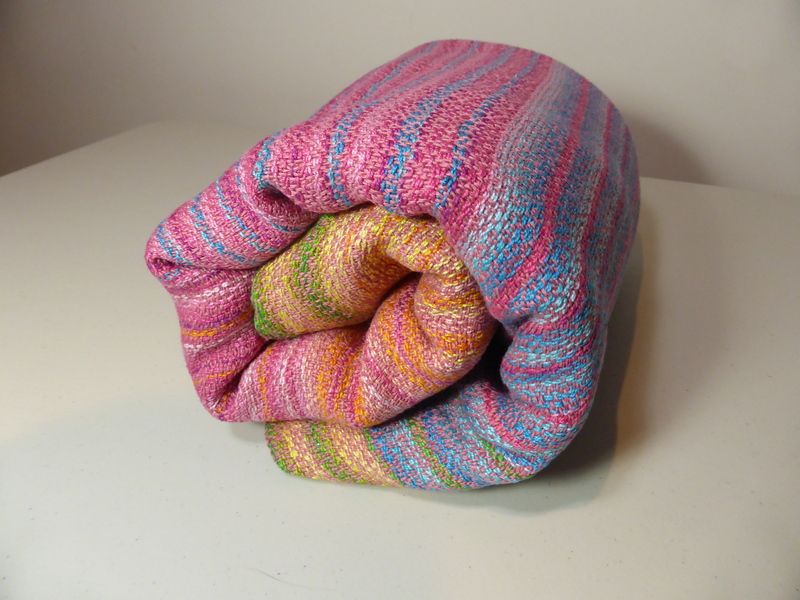 Glitter in the warp and weft accent tails. Hand-embroidered middle markers. 360 GSM. The Colours of India collection, wrap #15, with 10/2 mercerized cotton warp. Weft: 8/2 cotton/hemp blend, hand-dyed. Crackle weave pattern. Glitter in tail accent weft. Hand-embroidered middle markers. 325 GSM. The Colours of India collection, wrap #16, with 10/2 mercerized cotton warp. Primary weft: hand-dyed thick bourette silk. 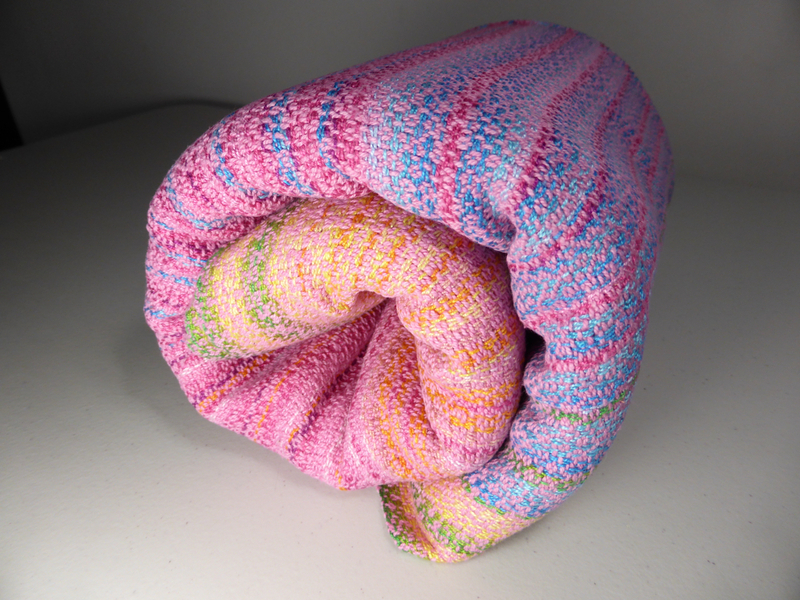 Accent weft: variegated thick bourette silk. Crackle weave pattern. 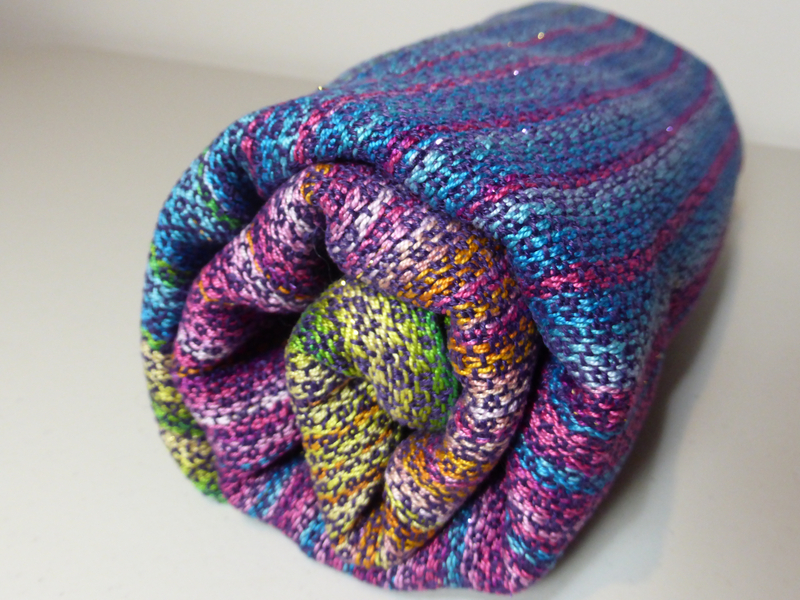 Glitter in the warp and the tail accent weft. Hand-embroidered middle markers. 360 GSM. The Colours of India collection, wrap #17, with 10/2 mercerized cotton warp. Weft: hand-dyed cotton / hemp blend. Crackle weave pattern. Hand-embroidered middle markers. 315 GSM. The Colours of India collection, wrap #18, with 10/2 mercerized cotton warp. 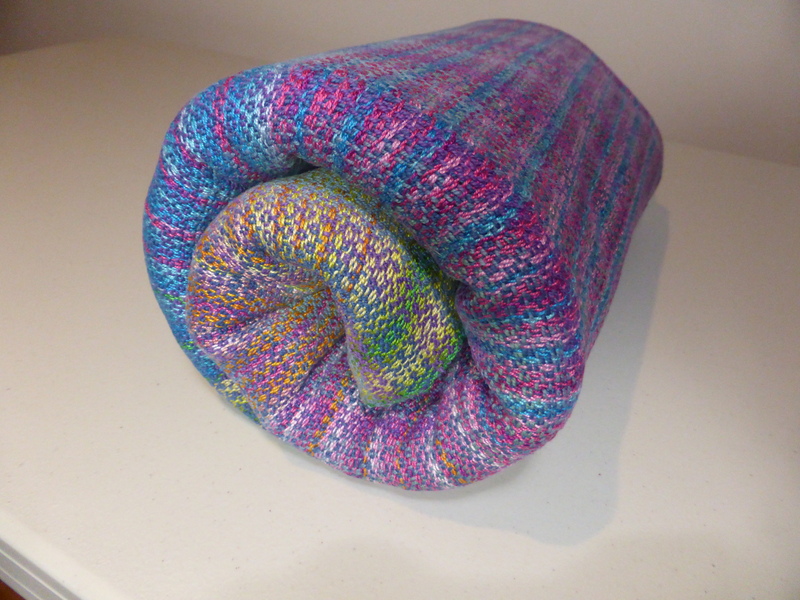 Weft: hand-dyed variegated thick bourette silk. Twill weave pattern. Hand-embroidered middle markers. 350 GSM.